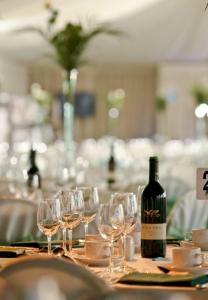 This stunning venue offers efficient, stylish and well-equipped events spaces for corporate events. Surrounded by 150 acres of ground and offering tasteful surroundings for receptions as well as unusual team building opportunities, The Rose Bowl really does have it all – including a brilliant catering department that offers value for money, quality and excellent service. The main pavilion on the first floor offers the Robin Smith Suite, which is ideally facilitated for conferences‚ presentations‚ breakfast meetings‚ and corporate receptions. Named after the South African batsman who scored 19,000 1st Class runs during his time playing for Hampshire, the suite holds a maximum of 200 delegates seated in theatre style, and features a high-quality LCD projector & screen that can easily plugged into almost any device. The PA system is cleverly placed for ultimate audio delivery, and the high-speed WiFi stretches to every corner of the space. This suite has plenty of windows to provide both natural light and far-reaching views of the grounds and the Hampshire countryside‚ and also offers a private bar and lounge area for registrations, break out sessions and buffet area. The Hambledon Suite is also located in the main pavilion‚ and can hold up to 80 in theatre style. The floor to ceiling windows can be blacked out if needed, and there are also glass doors leading out onto a spacious and scenic terrace overlooking the ground itself. Ideal for corporate entertaining as well as conferencing, this is a particularly popular venue choice during the summer months. Corporate entertaining during a game of cricket is a wonderfully civilised affair at the Rose Bowl, and you won’t get a better view of the pitch than from this room. Pimms, anyone? You also have the option to create your own layout here by using the partition wall, which can separate the largest events space in two. The Hambledon Suite also features a ceiling-hung LCD screen and PA, as well as WiFi and catering facilities. There’s no actual bar here, but the team of caterers usually set up a mobile bar – which gives you added flexibility in terms of layout, and also means you can serve drinks outside on warmer days. For a spot of team building, we recommend you have a go at Cage Cricket. Designed to be enjoyable and challenging for people of all sporting abilities (and levels of interest), your team will have a lesson in bowling and batting from a professional player at the club. Then, they’ll be divided up for a head-to-head challenge to win points, decided by the amount of hits and misses they get. It’s a really entertaining and rewarding way to spend an hour, and it’s been cleverly thought out to achieve the right balance between competition and fun.